Because, a few days ago, also after dinner (all cooked for a healthy weight loss, of course! 😉 ), I did what I sometimes do and went up for a bit of housekeeping on my blogs (yep, just like today). Only this time I took a glass of red wine with me (naughty, I know). And, as lazy as I am sometimes, I drank the glass and left it sitting next to the computer when I went to bed. Yuck Yuck Yuck!!!! I had seen this little sucker a couple of weeks earlier and tried to kill it, but it scuttled away faster than I could throw my weight around and hid between some unmovable furniture. Well, I had him this time!!! I couldn’t even finish him off this time, I just threw him out in the garden, for all I know he might be back in the house looking for revenge (or more wine!!). Unfortunately this episode has NOT put me off the odd glass of healthy red wine. I mean, once you wash the glass (properly! ), you are good to go again, right? Anyway, I thought I am going to share this with you all, it was just so – I don’t know – weird. And Yuck. And shocking. All in one. And for all of you that are wondering whether I have lost any weight yet, no I haven’t. 🙁 Still the same, I’m afraid. At least it hasn’t gone up! To be honest, I am sitting here and it is 10:49 pm and thoughts are circling through my mind about going downstairs into the kitchen and making myself something to snack, and I will NOT GIVE IN to those thoughts today. I have noticed that I always start to think about food late at night, especially when I am up doing work on my computer. The best way to avoid this is to head straight to bed. I ask myself – do I really want this food? NOOOO! I don’ t need this. I am full. I am satisfied. All I want is to go to bed and get a good nights sleep, because I am tired. I will be better off for it tomorrow. So all I will do when I go down is brush my teeth and hit the hay. Promise. No empty carbs late at night. Talking straight to myself in my head when the FOOD CRAVING hits seems to help me just a little to stop this trip into the kitchen late at night. I have actually managed to TURN AROUND a couple of times when I was already half in the kitchen to grab some fatty food, and I am very proud of that. I guess this is reason winning over emotion. So maybe I am making progress… ? And I think it is better do not eat after supper too. Is that a roach? Hehe. Anyway, I think it’s okay to give in to cravings sometimes, just not before going to bed! You are right, sometimes we just can’t avoid eating at night especially when you are watching TV then suddenly your favorite fast food had been advertise, it actually makes you feel hungry at one and wanting to eat something to satisfy our cravings. However, don’t ever eat too much then go to sleep, it is a big “no-no”, isn’t? Great! Now I´m not hungry any more. Thank you for sharing this picture. 🙂 I won´t eat today anything, so I´ll loose weight as well, won´t I? I have another idea. Put all products with empth carbs to trash. Leave some fruits and veggies for night trips into the kitchen. It is also late eating but much healthier. Thats funny experience ^^,.same with me, but on my food when I got late work. You must be careful next time. There is nothing I hate more than cockroaches…. Even taking a picture of one freaks the hell out of me! I mean I know the diet is something that you should be going for but I would throw that glass away!! Just kidding, hope you get the results you want. Best of luck! Looks like you made a friend out of that bug. Oh yeah! With a twist. EWwwww I hate cockroaches!!! They are all yuck!!! Anyway, thanks for sharing your experienced. Although you describe it in a funny way and with much humor, I really feel sorry for you. I understand that you are faced with a war on a daily basis and even more than that. I believe that the only way to win the war this, and I Mean to win in Knock-Out, is, find something else that gives me meaning and flavor to my life. I can feel the happiness came to me from inside. It fills me and I feel that much easier for me, and I’m less need something from outside that will give me happiness. What do you think about this ? Urgh! That insect in the wine glass looks so dirty. Stick with it!!! Something that helps me is to have some healthy snacks on hand to munch on when the mood hits. Things like carrots, celery, fruit and mixed nuts. It also helps if you don’t buy the stuff you really want to eat in the house. Anyway, good luck with it. Petra, I am so impressed you have the stomach to even snap photos of that creature! You surely have the will to stay on your diet. Best of luck to you! So funny! I think I will not eat anything tonight either! Thank you for help me on diet. And most important, never leave the used glass with red wine overnight! Ya sure as we know that “health is wealth” If one’s want to weight loss have to avoid fast food. Wow, that might put me off wine for a while. Petra, I am a working women and I find it very difficult to attend my Gym regularly. So even I do dieting. At late night whenever I feel hungry and feel like munching something, I just try to control myself to the best possible extent. If I still cannot, then I go and have a mug of warm milk (without sugar). This helps me to get out of hunger fast. I don’t know whether milk will help me to avoid adding calories or no? If the milk is full cream it will be quite a whopper to drink at night. But hey, I do love full cream milk, I think it tastes so much better than low fat milk. But drinking a glass of milk is probably still better than snacking on other stuff for a while. Is the law of the jungle. The weak die and the strong survive. I dont like bugs and I’am happy that he is gone. I think you have played hide and seek with this sucker.Think its offspring will be around. Well, I can say that I have not seen this roach any more since the incident. Might have found its way out the balcony… or simply died in a quiet corner here in my office. Either way, there are no wineglasses left overnight here any more! This is definitely one way to lose your appetite! HAHA! Thanks for the laugh! Even if you found the bug in your glass at least you found the pesky little thing! I hope you are successful in your endeavors to lose weight! haha, gross pics! I had a similar experience with a bug in my place a few months ago. IT was floating in my morning orange juice cup a few hours after breakfast, gross! It’s always great to have Red Wine with you and then thinking for your blog. I think in this case the sucker found a right inspiration for his next step of action. I’ve just found your blog and been reading with interest. Weight loss gets harder with age, I used to shrug off extra pounds with ease, now they seem determined to cling on. The only diet which seems to suit me long term is JUDDD, to which I’ve just returned after 18 months of injuries and enforced non-exercise have taken their toll. Combined with cortisol control and low GI for the up days, I’m hoping this will be a smooth ride. Your healthy eating sounds excellent, and ideal for maintenance, have you look at JUDDD for initial loss? It worked for me in the past, when nothing else would. Hi Clare, I had a quick look at JUDDD and it looks quite interesting, I had never heard of it before. If it works for you, very good! I have to agree with you that weight loss does get harder with age. Thank God I was finished long before this thing appeared! I must admit I am a bit of a binge eater at night as well because a couple of hours after dinner I get out the laptop on the sofa and just start working away, and before you know it I am feeling hungry again! This exact situation happened to me last night but fortunately I could not find anything in the fridge that was appealing to my hunger, so I didn’t eat anything else. I guess I need to keep less in the fridge to curb some of my bad eating habits, but then life wouldn’t be as fun if I did that! I guess I’ll stay away from the red wine though! Oh gawd! i hate roaches! Now that’s a good way to lose the appetite! Hope that cockroach has enjoyed drinking. LOL! There are many options to go for a healthy diet weight loss. I don’t get time to do Gym as I am quite busy with my office and don’t get time to go anywhere. So I have decided upon one thing that hence forth I am going to skip my lunch and instead carry some fruits and salad in my lunch box. Also while coming back home I prefer walking. It takes me approximately 1 hour to reach my place. But I am happy that at least I am loyal towards walking daily till home and also my diet. It’s been only one month now and I have reduced 2 inches. Even tough that made me feel like red wine. Maybe I will go and grab some before it’s too late for late night drink. Yikes! Red wine may be heart-healthy but I don’t know about bugs! EWWWW. this is my worst nightmare. unfortunately this sort of thing happens to me all the time in muggy NYC!! …doesn’t put me off the wine though. ha!!! Just wanted to know whether continuing with alcoholism is good in case you are on a diet or no? Because there is a lady in my Gym who has a personal trainer and according to him she is supposed to be on a strict diet with her regular exercises. So does diet include alcoholism too? Can we have alcohol at times if we feel like because for me it’s like almost impossible to stay without alcohol? Please suggest? I think you can have alcohol at times – in moderation, like with everything. Alcohol does have a lot of calories, so I think sticking to the one glass of wine a day is a good start. If you can stay away from it completely, it will be even better. There are a lot of diet plans available online but instead of following all of them and getting confused it’s better to follow one simple formula i.e. eat all those things that will give you a lot of proteins, vitamins, minerals and other essential nutrients but not sugar or calories. That’s it! 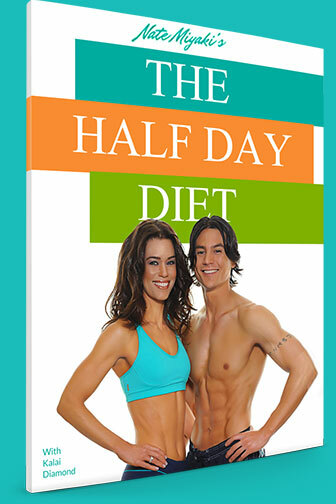 You now have a healthy diet plan with you. To stay fit you need to ensure that you have a diet which does not contains calories but it should contain a lot of fruits and greenies like cabbage, spinach, tomatoes etc. Also beans and sprouted seeds are good to have if a person wants to lose weight or for the person who wants to stay fit. Petra, the picture seem to be scary. Well personally I do not go to gym but make it a point to exercise at least for 20 minutes daily. I eat whatever I want but in appropriate proportions and some things like climbing up the stairs instead of using a lift. I have friends who are hog more than me but still are thinner than me. I wonder where does it all go! Red wine is good and many doctors agree that something in red wine appears to help your heart. It’s possible that antioxidants, such as flavonoids or a substance called resveratrol, have heart-healthy benefits. Loosing weight is very easy. Stop listening to others and following others diet. I would rather say that its better you plan your eating schedule by yourself. You should research online for the eatables that are loaded with calories. Stop eating them permanently. Also search for the foods which will help in increasing the level of nutrition in your body. Fruits like mango, bananas, custard apple help in gaining weight so avoid it to the best possible extent. Petra I think thats hilarious, even that little critter knows a little red wine is good for you. Glad it hasn’t put you off, a glass of good red wine does have great health benefits but its not necessary to share it with a roach. I don’t know about letting him run wild in your garden, they breed pretty quickly so are you sure this was the same little sucker you saw 2 weeks before! Follow a simple diet. It’s not necessary that you need to have boiled or steamed stuff like sprouted seeds, vegetables. Having fruits and coconut water will provide a lot of energy so as to survive for the day. Change your diet plans every week so as to keep your digestive system active. Eat on regular intervals to maintain the level of sugar in your body. All I can say is yuck . . . 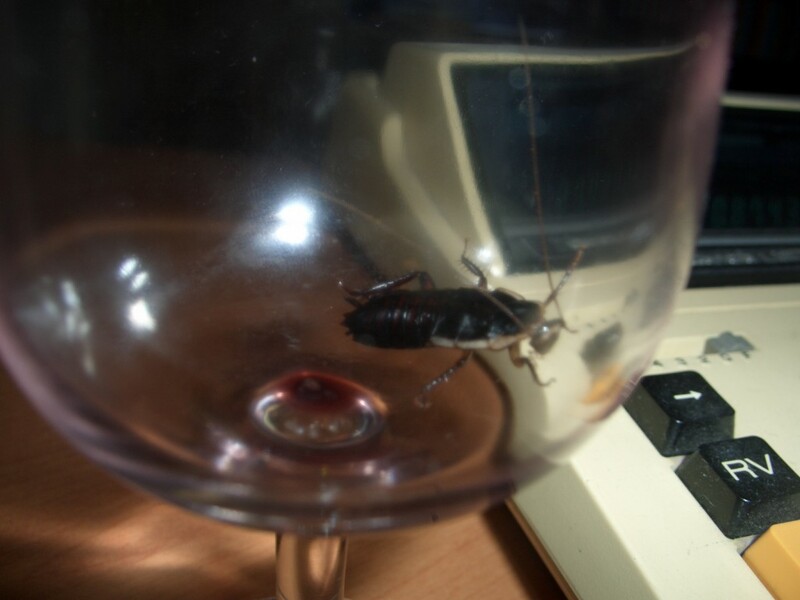 If your a cockroach and your gonna die, why not do it in a glass of wine. Keep up the good work and stick with it. Keep some healthy snacks on hand and try to keep the bad food out of the kitchen. “I am tired of convincing myself that this time surely I would be able to loose weight. But no matter how hard I try my strategies are still not prooving to be successful. That’s it! I can’t take it anymore. I have not left anyway that will help me loose weight. Do we have any pills that will help in shedding some pounds? Thanks for sharing this pictures…… Today I won’t eat anything So i think my weight will be loose. 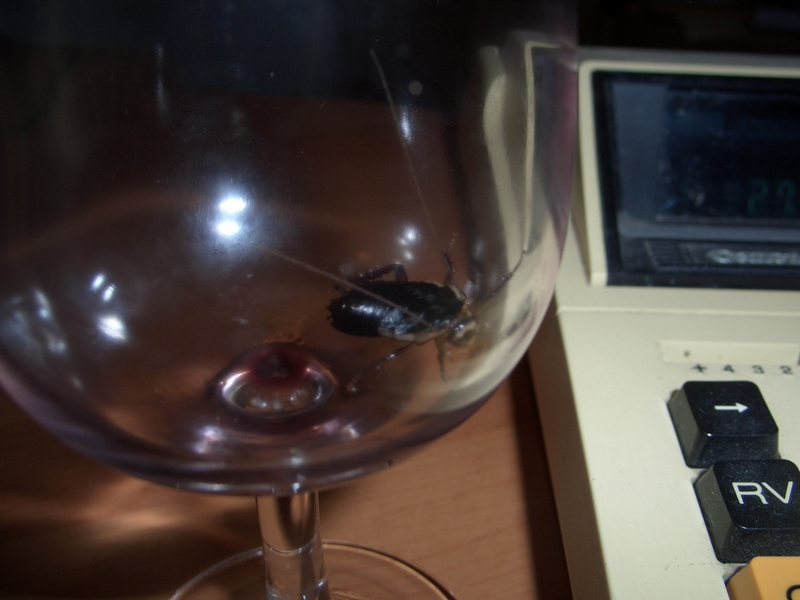 In this picture cockroach really enjoy drinking red wine………. [email protected] to make him fall in love with you´s last blog post ..How to Get a Boyfriend – 6 Effective Steps to get your boyfriend fast! Some of us don’t really know what exactly our diets should contain. For the sake of dieting we just avoid the basic stuff that we know we should. Whatever we do without complete info over it will lead us on a completely different track. I would rather suggest everyone to consult a dietician or your gym trainer before entering a diet plan. Instead of loosing I had gained weight while following that rubbish diet plan which I made. The biggest mistake I did was I did not include fruits and salads in my chart. I was completely starving apart from having my food (3 times a day). I was very upset to see the scale going up every time I weighed myself. Then finally I decided to consult a dietician to get a good diet plan. Now I have lost almost 4 inches in 2 months and have a good figure comparatively. Well done, and keep going! Zero figure is in trend these days. Those who already have a maintained figure still keep dieting in order to have a zero figure. Especially girls keep checking out each other in terms of their figure. You should listen to the way they shout when they see even half a pound of increase in their weight. It’s not difficult to loose weight till the time you are focused and continue your diet till the end date. I personally find a zero figure way too thin. I don’t mind a little bit of something on me. Sticks and bones can’t be that great to cuddle up to!! Petra, that is so funny! 🙂 You just made my day! Is the little sucker drunk? 😉 Anyways, about the food craving thing, sometimes it’s all in the mind. You are full yet you still imagine food and think you’re hungry again 🙂 I agree that talking straight to yourself can help when you are in that moment. Like this post! Everyone’s different in this world. Digestive system is not the same for everybody. Its better that we do not rely on anybody’s diet plan. Dietician try to study our daily routine and then accordingly they give us a diet chart depending on our food habits. So instead of following others diet plans, it would be feasible if we take the help of a dietician. I LOVE red wine, but I can’t say that if I saw that I wouldn’t be turned off from it forever! I love red wine minus the Critters, a glass a day helps me to wine down from a long day. Health´s last blog post ..Does your child have a school nurse? I’ve read a lot of articles online about dieting and weight loss. You are the most honest of all 🙂 Good read! Some of the dieticians even ask you to eat as much as you feel like. The only thing that they ask you is to change your eating timings i.e. you need to have high fiber food but only according to the timings they suggest for you. It completely depends on the body of a person following the diet. So I say that consulting a dietician is a must. [email protected] costumes´s last blog post ..Hello world! I am on a diet. I have hired a dietician who has suggested me a good plan. Surprisingly I am not supposed to starve at all. The only thing she has changed is the timings. She has suggested me specific time where I am supposed to avoid eating and the time I am should eat. I am loosing on my weight drastically and now I am back to my normal figure. It feels so good. Great work, you can be very proud! I am tired about reading all the blogs and articles on how to loose weight. After removing my frustration by dumping all my diet charts into the dustbin I realized it’s more important for you to be positive about loosing weight than just following a particular exercise or a diet and thinking it won’t be effective. Think that you will be able to achieve your goal in losing weight and see the difference yourself. Trust me! You will surely loose drastically. Including a lot of herbs and fresh vegetables and fruits is the only solution. Avoid consuming alcohol and stop smoking as far as possible. Weight Loss is not a one day program so sincere dedication and efforts would help in reducing more. Also avoidance of sugar to the extent possible would be beneficial for you and also a walk of 30 minutes would add cherry on the cake. Are you one of them who cannot just ignore if they see hot and spicy food cooked around? If yes, then it would be very difficult for you to reduce on weight if you are trying to do so. A strong will power, 100% dedication and focus towards all the calorie intake food will surely help you to loose weight at the earliest. Oh, that’s just gross! I don’t want to freak you out, but they say if you see a roach, that means that there are 10 more around the place that you don’t see. Weight Loss is something that everybody is after. Many of us have shared our views about weight loss on this blog. But I think everybody responds differently to different type of food. And it would be better if we share our true picture with our dietician and they would be the best person to guide us on how to loose weight quickly. The blogs name itself says “healthy diet weight loss”. That means that in order to reduce your weight you need to go on a diet. But diet does not means that you actually need to starve. It says that you need to have some healthy diet which will help you to remain stuffed but at the same time will also help you to shed some extra pounds of your body. 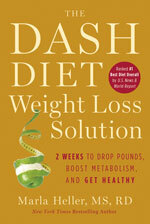 I have experienced a weight loss program under a dietician. She always recommended me to have herbs and since I could not have those herbs she gave it to me in the form of medicines and capsules. Yes I lost a lot of weight but after completing the course from her institute I have again started gaining weight even when I am following the same diet that she recommended to me. What should I do now? Just try and eat a balanced diet and eat in moderation – you need to find something that you can actually maintain. I cannot just live without food and as of now I am on a diet. My dietician has not stopped me from eating food but yes she has restricted me from in taking a lot of foodstuff. She only believes in following a high fiber diet. Can you believe she has asked me not to even have milk in my breakfast? I am unable to survive without milk and now I think I am on the verge of quitting my diet. I am soon going to call up all my friends and invite them for a clothes swap at my place. I have got a lot of clothes that I hardly wear and they are still in good condition. So throwing them away would not be a good idea. I think now it’s high time to give away those clothes by calling all my friends and my neighbors for clothes swap event at my place this weekend. What say? I wonder whether you have done the clothes swap, Marshall? I like you articles about dieting and weight loss. Nice job. ugh this is so scary, i hate these little creatures! Yuk. That bug will put anyone off their food. Seeing a few of those around you dining table certainly can put you off your food!!! Ui, I also hate bugs, they are so creepy. And those little flies and spiders…especially finding them in my food would be awful. uffff cockroach is quite nasty , yaks i don’t like this. web design phoenix´s last blog post ..Why don’t 404 Website Pages disappear immediately from Search results? Looking at that crawling creature will definitely make you lose your appetite and losing weight wouldn’t be a problem anymore. But its a good thing it is only on the glass and not on your food! This happened to me 14 years ago! I knew I wasn’t the only one. I love red wine regardless! that was gross..lol. but i am just concerned if that glass is sanitized after? Baout your food craving at the middle of the night is not too normal. at that time, your body needs rest. You must have it corrected. the taste buds for food (in my opinion). Plus I drinks lots of water flavored with Mio which keeps me full and not craving carbs! « How Could I Let This Happen?? ?